Sweet sound and a solid streaming ecosystem make Yamaha's soundbar a winner. Yamaha’s YAS-706 MusicCast is a flexible, feature-rich soundbar that will fit perfectly in any existing MusicCast whole-home audio ecosystem. It could also be a great first step in building one. This is a 2.1-channel system consisting of dual 2.125-inch woofers, dual 3-inch subwoofers, and four .75-inch tweeters in the soundbar. The sub sports a 5.5-inch cone woofer. Once unpacked, the wireless subwoofer paired instantly with the soundbar. I didn’t need to touch a thing to get going. If you don’t want to use the subwoofer wirelessly, or if you decide to upgrade it down the road, the soundbar has a subwoofer pre-amp out. Yamaha says this for the supplied subwoofer only, but there’s nothing really stopping you from plugging any self-powered sub into that port. Yamaha says the YAS-706 is rated to deliver 285 watts total power, with the soundbar pumping out 210 watts while the subwoofer delivers 75. There are lots of input options on the YAS-706, which will make it easy to fit into a variety of environments. There are two HDMI inputs with 4K HDR passthrough and one HDMI out with ARC (Audio Return Channel). Both Toslink optical and S/PDIF coaxial digital audio inputs are present, as is an analog RCA stereo input. Networking options include 2.4GHz 802.11n and hardwired ethernet. 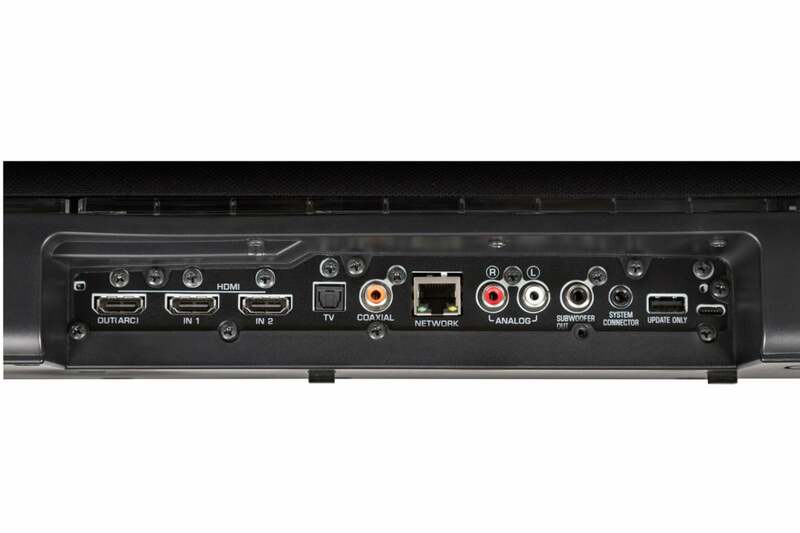 Yamaha is a bit stingy with the HDMI inputs, providing only two inputs and one HDMI out with ARC. On the bright side, you’ll both optical and coaxial digital audio inputs, a preamp subwoofer output, and analog stereo RCA inputs. If you’re placing the soundbar in front of your TV, there’s a good chance you’ll obstruct the TV’s infrared receiver. Yamaha has a slick solution for that: The YAS-706 has its own IR receiver in front to capture the messages your TV or set-top box is sending to the TV. It then re-transmits those instructions to the TV via an IR emitter on the back of the speaker. There’s one caveat to this feature, however; you must orient the YAS-706 on its back so that its speakers fire upward. Higher frequencies are directional, and their tonal character changes the more you go off-axis. There doesn’t seem to be an option to take advantage of this smart feature if you put the Yamaha in the upright position so that its speakers fire directly at the audience. 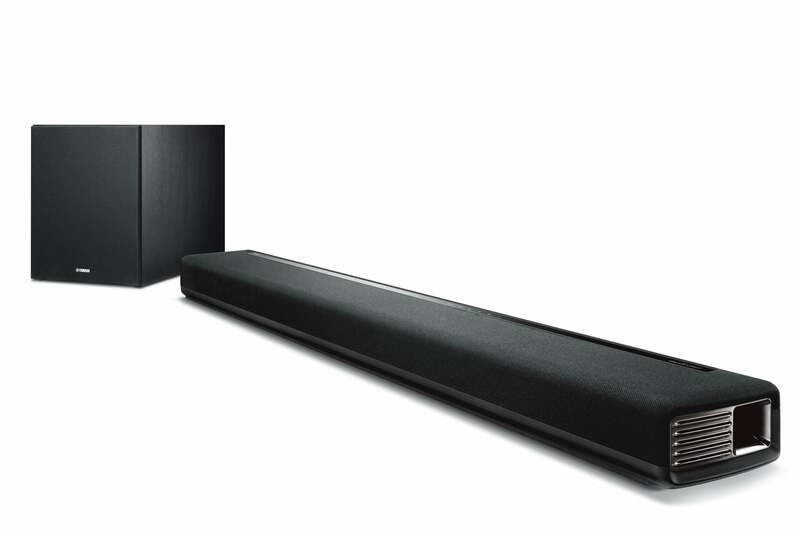 Denon’s HomeCinema soundbar, by contrast, comes with a wired IR repeater/blaster that provides greater placement flexibility. Yamaha wants you to know that MusicCast is an inseparable part of this soundbar’s functionality. As soon as I opened the Yamaha YAS-706’s box, the top flap greeted me with a graphic instructing me to download the MusicCast app now. Once I opened up the soundbar’s internal box, the very next thing I saw was a brochure welcoming me to MusicCast. Hint, hint? Yamaha’s MusicCast app is easy to master, atlhough it’s quite as good as the Sonos controller app. If you’re unfamiliar, MusicCast, it’s Yamaha’s wireless music streaming technology that runs over Wi-Fi. MusicCast is very flexible. It supports 10 total devices in total, and it can also stream audio to a Bluetooth speaker or headphones. You can pair Bluetooth headphones to the YAS-706 for late-night listening, for example, but you can’t use this feature if a Bluetooth device is your audio source. You’ll be hard-pressed to find a file format—including high-res codecs—that MusicCast won’t play: Apple Lossless (ALAC) up to 96kHz/24-bit; FLAC, WAV and AIFF up to 192kHz/24-bit; WMA; MP3; and more. 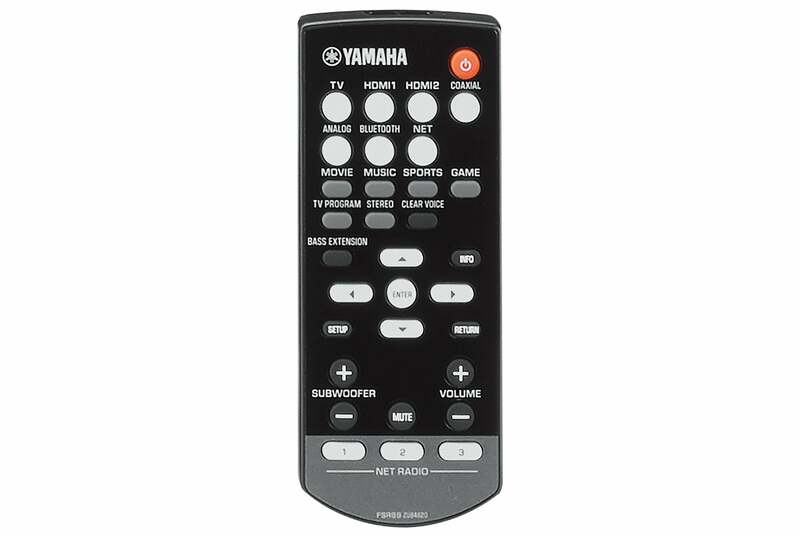 Using the YAS-706 with its included remote control is a very different experience than controlling it with the MusicCast app on your smartphone or tablet. 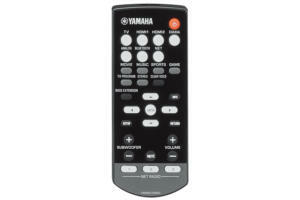 Yamaha’s remote is pretty good. It’s small, but its buttons are of different shapes, colors, and sizes to make it easy to find the functions you want. The print is large and easy to read, even for older users with less-than-optimal eyesight. Legible type on a remotes isn’t a given. That said, your YAS-706 experience might not be free from frustration. Allow me to elaborate. Yamaha’s remote isn’t worthy of a $1,000 soundbar. Fortunately, the MusicCast app more than makes up for it. Many soundbars I’ve tested have a clear numerical display so that you can easily see the volume level. That’s not the case with the YAS-706. It just displays a series of green lights across its face. If you have the soundbar at a very low volume, it will start with one, then two, then three green lights. As you make the volume louder, the number of green lights increases, but you won’t really have any sense of what the actual volume is. And volume level isn’t the only information those green lights are meant to convey. Pressing any buttons on the remote will cause them to blink on and off in Morse-code-like patterns. Turn on Yamaha’s Clear Voice dialog-enhancement feature, for instance, and the lights will blink three times. Turn it off and they’ll blink once. You’ll need the user manual to decipher what all the patterns mean, but if you need glasses to read things at a distance, you probably won’t be able to make out the individual LEDs anyway. To make matters worse, should you place the soundbar on a cabinet in its slimline position, with the speakers facing up, you won’t get any visual feedback at all because those lights will also face up. I preferred using the soundbar in its upright position (as it would be when hanging on the wall) with its speakers facing my listening position. All my comments from here on out assume that orientation. 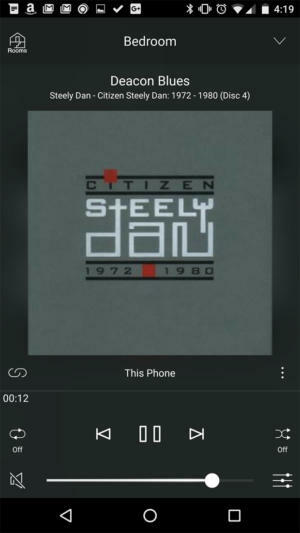 Now if you use the MusicCast app on your smartphone or tablet, device none of that will matter: The well-designed app provides you with a slick, elegant, and incredibly pleasant user experience. The app informs you precisely what the speaker’s current settings are and should be considered a must-have in order to get the best experience from the YAS-706. I loved it. In the fall, more than 40 Yamaha MusicCast products, including the YAS-706, will receive a firmware update that delivers compatibility with Alexa-compatible devices, including the Amazon Echo, Echo Dot, Echo Show, Amazon Tap, and Amazon Fire TVs. Since the firmware is not yet available, I wasn’t able to evaluate this Alexa skill, but based on other experiences I’ve had using Alexa to control connected-home and home-theater devices, this promises to be an exciting new feature. Denon says it is also developing an Alexa skill for its Heos HomeCinema soundbar, but the company has not announced a target date for its availability. If you put the YAS-706 in front of your TV in an entertainment center, you’ll want to orient it so that the speakers are firing up, instead of horizontally into the room. Yamaha’s Clear Voice technology makes dialog in television programming, movies, and even music more intelligible. Some soundbars take an aggressive approach to dialog enhancement, which can make voices—and any other sound in the same frequency range—sound unnatural. Yamaha takes a conservative route with Clear Voice and thoroughly respects the integrity of the audio source. Depending on the content you’re watching, you might even have difficulty discerning a stark difference between Clear Voice being on or off. I liked Yamaha’s approach: It sounded natural and balanced, although I did notice it more when the soundbar was in its slimline position, with the speakers firing up. Clear Voice enhanced the dialog in every scene of Rogue One: A Star Wars Story that I played. The conversation between Galen Erso and Director Orson Krennic in the movie’s opening chapter was consistently clear. When the scene turns to the trading post on the Ring of Kafrene, you have the chaotic din and bustle of the outpost’s markets. Enabling Clear Voice accentuated some of the upper mid-range and higher-pitched sounds, but it didn’t adversely alter the audio as all the soundbars at other price points did. 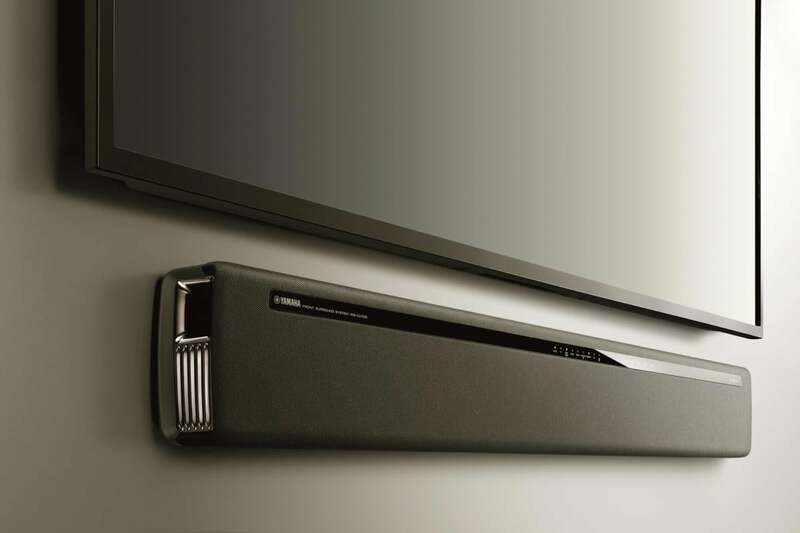 The YAS-706 comes with several simulated surround-sound effects based on Yamaha’s Air Surround Xtreme digital signal processing, but none of them will fool you into thinking this soundbar produces anything other than stereo. They do, however, create a slightly more three-dimensional soundstage using psychoacoustics. I didn’t particularly like every sound mode. Given my room’s acoustic character, plain old stereo and the music setting sounded the best. The movie setting in particular sounded fake. And when characters spoke, they sounded as if they were speaking through cupped hands. 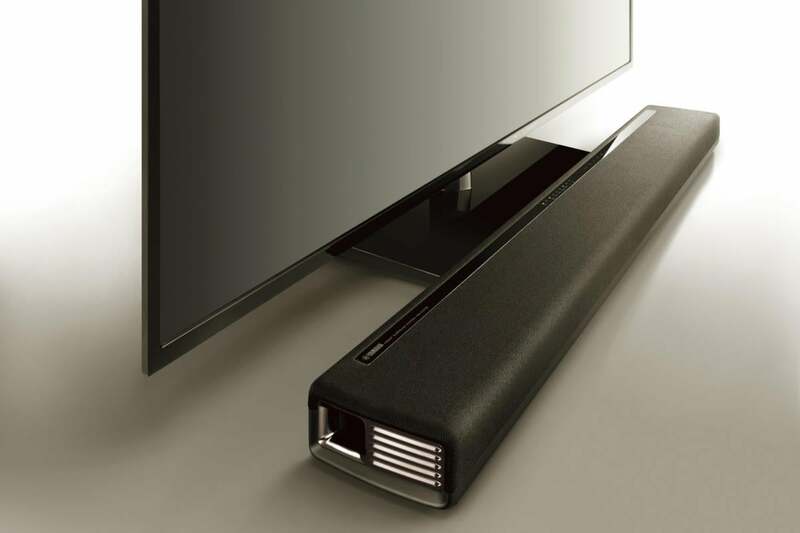 To view the YAS-706 simply as a soundbar for movies and television programming doesn’t do it justice. Looking for streaming services? There’s support for Spotify, Tidal, Pandora, Napster, SiriusFM, and more. Interested in streaming music? You can use Bluetooth, Apple AirPlay, any DLNA server on your network, or Yamaha’s own MusicCast technology. 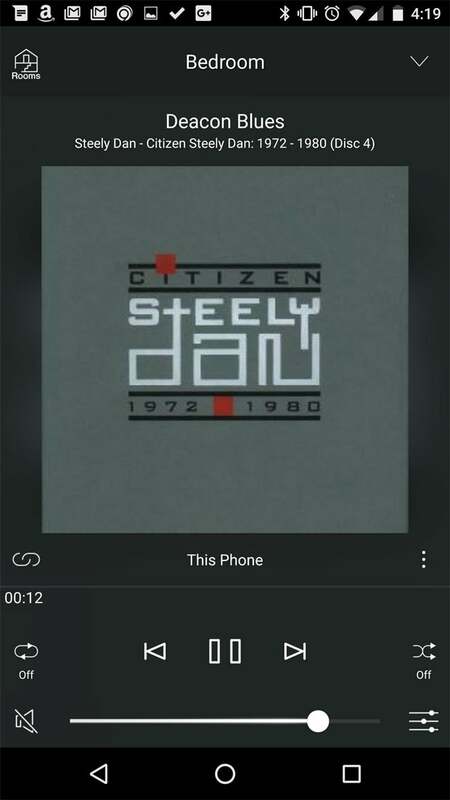 Is your personal music library encoded with high-resolution codecs? I had no problem playing FLAC and ALAC files via my Twonky media server. The presence of a preamp subwoofer output on the YAS-706 means you won’t be stuck with its subwoofer forever. An upgrade is as easy as plugging in a cable. While the included subwoofer is modest, its bass response was solid and I liked the overall dynamics on Bonnie McKee’s “Trouble.” For a soundbar, the YAS-706 delivered a decent soundstage, though don’t expect the deep and wide imaging you get from standalone stereo speakers. TechHive explored Yamaha’s MusicCast ecosystem in depth early last year, so I won’t do that here. I will say that the system is impressive—on par with and perhaps better than market-leader Sonos. If you’re an iOS user and subscribe to Apple Music, or if you store your music using Apple’s iCloud, be aware of is that MusicCast cannot play those files. As with movies, I preferred listening to music either in stereo or with the music DSP preset enabled. In my room, music mode filled out an otherwise thin midrange and brought the overall sonic presentation closer to a balanced, reference level. If you’re considering a soundbar at this price point, then you’re likely looking for a unit that can serve as part of a whole-home audio set up. If you’ve made a previous commitment to Yamaha products and Yamaha’s MusicCast ecosystem, the YAS-706 will be a perfect fit. It delivered stellar performances with movies and music, and MusicCast is a terrific whole-home audio system. Now for the inevitable caveat. If you’re looking at the YAS-706 purely as a soundbar, you won’t want to rely on its primitive remote control. The best way to use this speaker is with the MusicCast app on your smartphone or tablet, which could be a problem if you’re buying this speaker for an older relative who isn’t smartphone or tablet savvy. Apart from that, this speaker checks all the most important boxes. You'll love this soundbar if you use the MusicCast app and have other MusicCast speakers. It's slightly less compelling when judged soley as a soundbar.